During our BYGL Inservice call this past Tuesday; Pam Bennett (Clark County) and Amy Stone (Lucas County) reported observing high grasshopper populations in southwest and northwest Ohio, respectively. This is the time of year when most grasshoppers are still nymphs which may make identification a challenge. However, the four most common grasshopper species found in Ohio landscapes include the Differential Grasshopper (Melanoplus differentialis), Red-Legged Grasshopper (M. femurrubrum), Green-Legged Grasshopper (M. viridipes), and the Carolina Locust (Dissosteira carolina). All are capable of producing dramatically high populations (= outbreaks). Populations for these and other grasshopper species can fluctuate dramatically from year-to-year with climate playing a critical role. Dry summer conditions support grasshopper egg survival which is one of the reasons grasshopper outbreaks are more common on the Great Plains compared to Ohio. Grasshoppers lay their eggs in the soil and long periods with wet soils can drown eggs or support fungal infections that will kill the eggs. Conversely, low soil moisture favors egg survival. Nymphs and adults have chewing mouthparts and are capable of causing serious plant damage; however, as the nymphs mature to adulthood, the potential for grasshopper damage increases. Late instar nymphs eat more compared to early instars and adult grasshoppers are more prone to move en masse to new locations. Late season grasshopper problems often arise when adjacent agricultural crops are harvested or grasslands mature causing grasshoppers to move to find new food sources. Defoliation is the primary injury to plants, but fruit and ripening kernels of grain will also serve as food. Indeed, grasshoppers will feed on just about anything as long as they do not detect a feeding deterrent. Reports from the Great Plains are common of grasshoppers eating paper, paint, window screen, window or caulking, fence posts, hoe handles, etc. during grasshopper outbreaks. 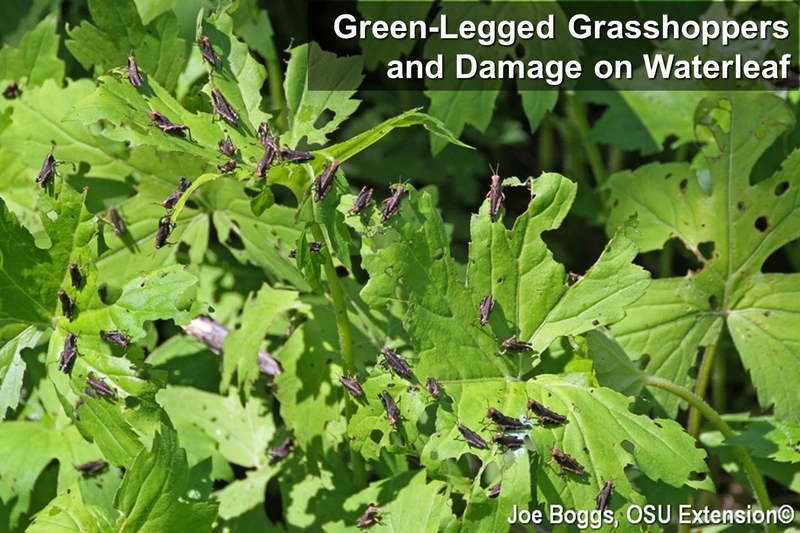 Heavy infestations of grasshoppers may require chemical treatment to reduce or prevent serious damage to sensitive plants.